Now youngsters can test drive the fantastic Mazda MX5 without even passing their test - available at eight great UK locations. 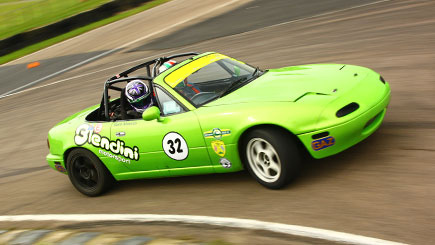 This race car is based on the sleek Mazda MX-5, and has been specially built to amaze on the circuit. Start off with a full safety briefing then climb into the driving seat just like a real racer. Once revved up and ready to go, drive three thrilling miles of the circuit with your instructor in the passenger seat to offer tips, guidance and encouragement from start to finish. This is a dream come true for budding junior petrol heads! At least one date every two months (could be any day of the week) at each venue. Please note a £25 upgrade fee for weekend dates at Blyton Park and £25 upgrade fee for Castle Combe applies (payable on booking). Minimum age is 10, maximum is 17. Minimum height is 4'5''; maximum is 6'6''. Maximum weight is 18 stone. Children must be accompanied by a parent or guardian and must remain at the venue during the child's period of activity. Expect to be on-site for one hour including a briefing and three miles driving the Mazda. Please arrive around 15 minutes prior to the booked start time to ensure a prompt start.